Oops! We realize this page is out of date by about a light year and will try to correct that quickly, though don't hold us to it. In the meantime, for the current events, just check out the home page. Tix are available in advance for $25 ($30 at the door), which includes Pig Roast, Hamburgers, Hotdogs, Salads & Draft Birch Beer. For more info, see www.clintonelks.org. Fall Festival, Craft Fair and Walk-a-thon to benefit cancer patients and their families. Please come out to support this event and help a neighbor in her fight against Hodgkins Lymphoma. There will be live music and vendors at the park throughout the day - please stop by!!! Saturday, November 17 - Clinton Elks Annual Toy Drive. Clinton Elks Lodge - County Rd 617, Pittstown, New Jersey 08867. Cost: A toy, or $10. Or both - it's for the kids for pete's sake! 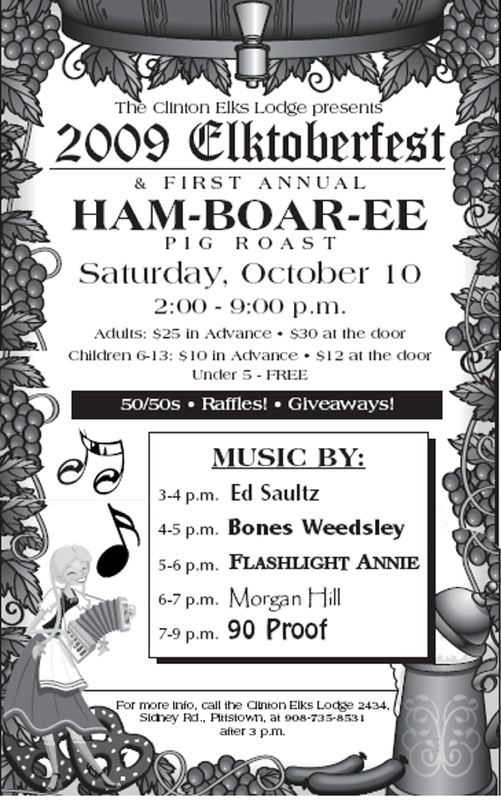 The annual Elkstoberfest concert to benefit the various charities of the Clinton Elks. 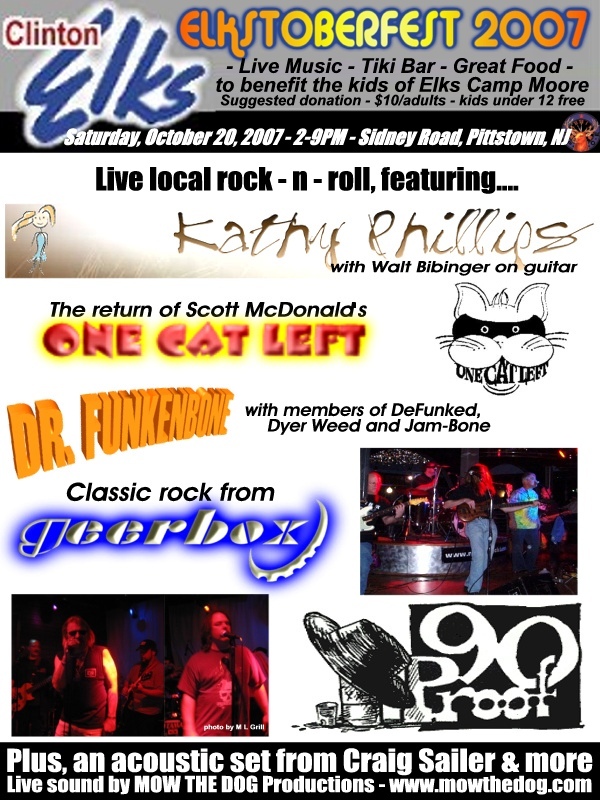 This year's Saturday event featured performances by Kathy Phillips & Walt Bibinger, Craig Sailer, One Cat Left, Dr. Funkenbone (featuring members of DeFunked, Dyer Weed and Jam-Bone), Geerbox and 90 Proof. Friday, August 31, 2007 - The Country Westernaires @ the LINC in Philly! We played at the entrance of Lincoln Financial Field before the season-opening kickoff of Temple vs. Navy. Photos from the event are available from the myspace link above! Tommy Lunger's annual Elks Music Fest to benefit the handicapped children at Elks Camp Moore. This year's Saturday event featured performances by Dave Cahill, the Country Westernaires, Dyer Weed and 90 Proof. 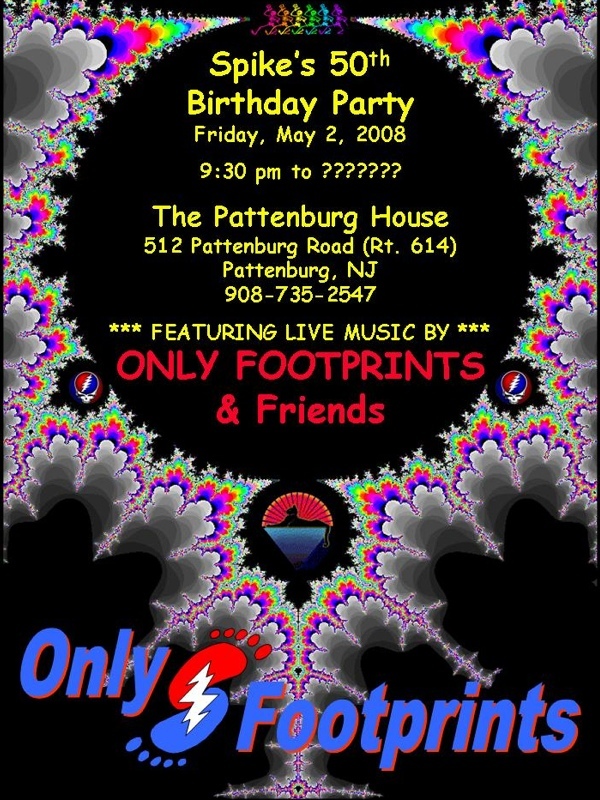 420 Extravaganzapaloozapottamus with our old friends from Only Footprints (the Dead, Little Feat, Clapton, Allmans covers & more), plus an opening acoustic set from Toby Ray Loyd. Dyer Weed, Citizens Band Radio and Souls Release teamed up for a good ol' rock and roll show at the legendary Stanhope House. Mow the Dog & the Pattenburg House presented another afternoon of great music from some of the area's finest players. Members of Dyer Weed, Defunked, Geerbox, Toga Party, Jam-Bone, the Fat Daddies, 90 Proof and more joined the jam! It's the party night of the year, and Dyer Weed & friends will invade the Pattenbird House for some pre-holiday fun. Saturday, October 14, 2006 - PlaygroundPalooza! Dyer Weed, Dave Cahill, Chemical Swing & the mighty 90 Proof Band teamed up for a fundraiser to bring playground equipment back to the kids of Hampton, NJ..
Mow the Dog provided sound for a very special fund-raising event to benefit the Alex, Devin and MacKenzie Educational Fund. Music from 90 Proof & Friends, Dyer Weed, Geerbox and Freedom. Mow the Dog provided sound for the annual Day in the Park community picnic at Lebanon Twp's Memorial Park, featuring music from Neil's Garage Band, Bruce Tunkel, the Keep, and Dyer Weed. Mow the Dog's third community jam was an amazing afternoon of music from too many incredibly talented local performers to list. Check out all the photos from the event. NOW AVAILABLE - JERRY JAMS CD SETS - 3 CD'S FOR JUST $20!